EnviroReporter.com features the work of investigative journalist/publisher Michael Collins and editor/webmaster Denise Anne Duffield. EnviroReporter makes extensive use of original radiation tests, videos, databases, photographs and graphics. These multiple media platforms engage the reader and back up with hard data multiple discoveries that have been made in the course of ongoing investigations. Environmental problems are caused in large part by corporations, governments and people. Investigating environmental issues isn’t just about the numbers; it’s about divining the character and intent of a wide range of people and players. It’s about getting to the truth and reporting it with the authority that earns the trust of the reader. Southern California legacy media outlets for this work have included LA Weekly, Miller-McCune, Ventura County Reporter, Pasadena Weekly, OC Weekly and Los Angeles magazine. Collins has also appeared on numerous television shows and Internet radio discussing Fukushima meltdowns fallout in the Pacific Ocean and North America, Rocketdyne, Runkle Canyon and other environmental stories. 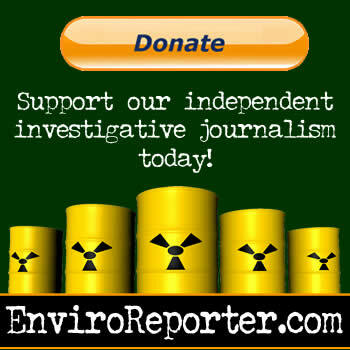 Please consider making a donation to EnviroReporter.com in order to support our independent and hard hitting reportage. There is no other online news organization covering these issues so in-depth and factually. Ten years of hot news, real hot news with exposés, awards and accomplishments. EnviroReporter.com wins First Place “News Organization – Exclusive to the Internet. Rolling into our fifth year of in-depth investigations, we reflect on one multi-award-winng investigation’s $4 billion impact. 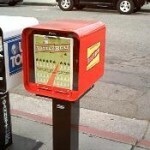 EnviroReporter.com celebrates three years of hard hitting reporting oft-times in conjunction with print media partners. Second anniversary of EnviroReporter.com is also tenth year of Michael Collins’ in-depth environmental exposés. LA Press Club’s 2007 Online Journalists of the Year are Denise Anne Duffield and Michael Collins. Five awards in total. Ventura County Supervisor John Flynn honors Collins at LA Press Club for work he and Denise Anne Duffield have done. EnviroReporter.com‘s Michael Collins and Denise Anne Duffield rack up the awards for their work. Dean Kuipers chronicles Michael Collins’ investigation of Ahmanson Ranch. “How investigative reporting stopped a public health disaster,” says CityBeat‘s Dean Kuipers of Collins’ reporting. 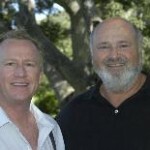 Dr. Bennett Ramberg’s Los Angeles Daily Journal article crediting Collins with stopping Ahmanson Ranch development.